Cistus, Halimium, and Helianthemum are three genus of the family Cistaceae that are often grown in gardens. Each genus has several subspecies and named cultivars. The plant was named kisthos or kistos in ancient Greek, which is the source of the modern name Cistus. Cistaceae are small broadleaf evergreen shrubs or subshrubs, most of which originated in the Mediterranean area. They prefer dry, sunny habitats and poor soils. The flowers are yellow, pink, or white, although some cultivars are multi-colored. Many of these plants can create a symbiotic relationship with root fungi of genus Tuber. All of them are well adapted to surviving wildfires. Several Cistus species exude ladanum, a sticky aromatic substance that is used in the manufacture of incense and that forms part of the Holy Oil of the Greek Orthodox Church. Ladanum has been collected since antiquity. One common collection method involved letting goats graze among the plants and then combing the ladanum that stuck to the hair of their legs and beards. Cistus should be grown on poor to moderately fertile soil with a gritty texture. An overly rich soil stimulates soft growth that is not likely to live through the winter. Don't use compost or an organic mulch; a gravel mulch is acceptable. These plants tolerate a fairly wide pH range, although there is some variability among the species. Good drainage is essential! Cistus are very susceptible to root rot in wet soils. You can add grit to the planting hole if necessary to improve drainage. Cistus should be deadheaded during their blooming period. After blooming, the bushes can be pinched back to stimulate bushier growth. These plants are not long-lived, so you will need to replace them routinely. Eight to ten years is the average lifespan for the species, and up to fifteen years for the hybrids. When planting, handle the rootball gently. Do not tease the roots out from the rootball; they are very brittle, and the feeding roots tend to be concentrated around the outside of the rootball. Cistus should be planted in late spring or early summer. Add some grit to the planting hole to improve drainage if needed. Cistus can be deadheaded to improve their appearance during the bloom period. Many growers recommend cutting them back lightly annually in autumn for mild winter regions or at the end of winter for colder regions. 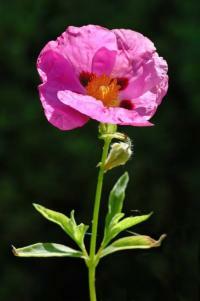 Cistus can be propagated by rooting softwood or greenwood cuttings in summer. Cistus are beautiful garden plants. They thrive when grown in gravel or in containers, as well as in beds. They are beautiful planted with with other Mediterranean shrubs, such as lavender, rosemary, and santolina. Some Cistus species are used to produce an aromatic resin, used in the perfume industry. Others may one day be used as host plants for truffle mushrooms, as they can form a mycorrhizal relation with truffles. Many Cistus species are endangered or threatened in the wild, since their habitats are shrinking. White Rock Rose (Cistus Albidus) - The name of this is derived from the whitish tomentum which clothes the leaves and young shoots. It forms a compact bush 2 to 4 feet high; the rose-colored flowers are about 2 inches across, and the style is longer than the tuft of yellow stamens. S. Europe. Cistus Alyssoides - Compact and shrubby, not more than 6 inches in height. The foliage greyish-green, spangled with lovely yellow blooms each about 1/2 inch across, and having a tiny brown blotch at the base of each petal. The flowers are borne in little clusters of four or five at the extremities of the growths. Cistus Bourgaeanus - a native of the Pine woods of S. Spain and Portugal, where it flowers in the month of April, grows a foot in height, and has prostrate branches covered with narrow dark green leaves. The white flowers are about an inch across, and it is a good plant for a sunny spot in the rock garden. Cistus Crispus - This forms a compact bush, 1 to 2 feet high, with tortuous branches, the rose-colored flowers nearly 1 inch across. There are some hybrids between this species and C. albidus which are nearer the seed-bearing parent than they are to C. albidus. Cistus Cyprius - This is a handsome bush like the Gum Cistus, but the flowers appear several together instead of solitary. It is nearly hardy-at least, in the south-has a glutinous exudation, and the flowers are large with a dark spot at the base. It is said to be a native of Cyprus, but doubtfully. Florence Rock Rose (Cistus Florentinus) - A handsome bush, flowering freely and of easy culture, and I find it hardy and enduring on soils where other kinds perish. It is evergreen and charming on the tops of dry walls and banks, and for the bold rock garden one could not desire a prettier bush; 2 to 3 feet high, bearing myriads of white flowers throughout the summer. Cistus Glaucus - A much-branched bush, 1 to 2 feet in height, with red-brown bark; the upper surface of the leaves is dull green, glossy, and glabrous, the lower strongly veined and clothed with a hoary down. The flowers are large, white with a yellow blotch at the base of each petal, and the very short style is much exceeded by the stamens. S. Europe. Hairy Rock Rose (Cistus Hirsutus) - A shrub 1 to 3 feet high; the young shoots and flower-stalks are hairy, as are the leaves on both surfaces; the flowers whitish, and the style is shorter than the stamens. S. W. Europe. Gum Cistus (Cistus Ladaniferus) - One of the best; the leaves, smooth and glossy above, clothed with a dense white wool beneath. The large flowers are white, in some forms with a large dark vinous-red blotch towards the base of each petal; in others without blotch. It also varies in the size of the leaves, the extreme forms having narrow, almost linear, leaves. This seeds and naturalises itself freely on dry banks in a wood of mine. Bush Rock Rose (Cistus Laurifolius) - The hardiest kind; in some southern gardens plants exist, which have withstood many winters. The flowers are white with a small citron-yellow blotch at the base of each petal. It requires no protection, and may be raised from seeds, which ripen in abundance, and also by cuttings, which, however, do not strike so freely as in some of the other kinds. S.W. Europe. Cistus Lusitanicus - A pretty kind of garden origin, which makes a shapely bush of spreading habit and slender wiry stems, covered during summer with large white flowers marked with a deep crimson spot at the base of each petal. Narrow, bright green foliage, which is slightly viscous. Montpelier Rock Rose (Cistus Monspeliensis) - Widely distributed in the Mediterranean region, and very variable in size of its leaves and also in stature of plant; in some spots it hardly grows more than 6 inches in height; in others to 6 feet. The flowers are white, about an inch in diameter, each petal bearing a yellow blotch at the base. 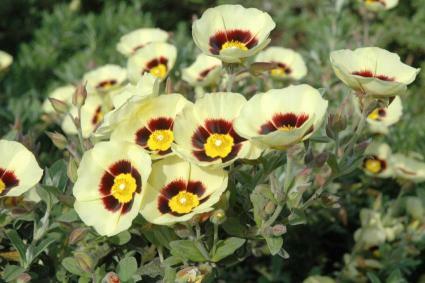 Cistus Populifolius - oplar-leaved Rock Rose) is a robust kind, with large rugose, stalked, Poplar-like leaves and medium-sized white flowers, tinged with yellow at the base of the petals. Varieties of C. salvifolius are often misnamed C. populifolius in nurseries and gardens. Amongst the numerous forms of this species may be mentioned C. narbonnensis, with shorter flower-stalks, smaller leaves-altogether a smaller plant than the type-and C. latifolius, another with broader leaves. S. Europe. Sage-leaved Rock Rose (Cistus Salvifolius) - A variable kind, and of slender habit, with Sage-like leaves, and long-stalked, white, yellow-blotched flowers. In a wild state it is found all along the Mediterranean, and a number of slightly varying forms have received distinctive names, but do not appear to have been introduced to gardens. Cistus Vaginatus - the largest of the red-flowered kinds; robust, with large-stalked, hairy leaves, and large, deep, rose-colored yellow-centred flowers. The stamens are more numerous in this than in, perhaps, any other Cistus, and form a dense, brush-like tuft, overtopped by the long style. Cistus Villosus - A Mediterranean kind, a variable and erect bush with firm-textured leaves. The flowers of all the forms are rose-colored, with long styles. C. undulatus is a variety with wavy-margined leaves. C. incanus represents what may be regarded as the common typical form. C. creticus is another with deeper rose-red flowers than those already mentioned.